Vudu currently offers digital HDX copies of “National Geographic: LA ’92 Documentary” to own. This is not an Ultraviolet purchase, but is available for download/streaming via Vudu. Expiration is May 11. GooglePlay is free to own, Click Here! Youtube is available for rent, Click Here! Amazon is available for rent, Click Here! 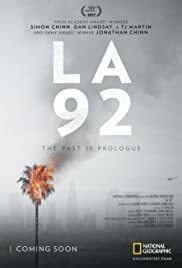 LA 92 will be made widely available today through May 11 on streaming platforms including Natgeotv.com, video on demand (through cable provider set-top boxes), cable provider sites and apps, Nat Geo TV apps (iPhone, iPad and Apple TV, Roku, Android phones and tablets, Xbox One and 360, Samsung Connected TVs), iTunes, Hulu, YouTube, Facebook, Amazon, Sony Playstation, GooglePlay and more.